Awhile back, I wrote an introductory article titled “Humidity! A Guide to Understanding How Humidity Affects Guitars” where I covered the basics of humidity, its effect on guitars, and how to tell whether you may have a problem or not. So now that you know the basics, this post gives specific product recommendations. Whether your climate is bone dry or soaking wet, there are products here to protect guitars in either situation. As usual, I’m personally familiar with every product on this page. They’re all things I use myself, have used in the past, or have thoroughly tested, so you can rest assured that they’re great. I sometimes get asked, “I live in [location], do I need to worry about humidity?” The fact is, I have no idea, even though the weather data for your location is readily available. I own 3 of these Oasis hygrometers. This one shows my room’s humidity and the others are used inside guitar cases when I travel. 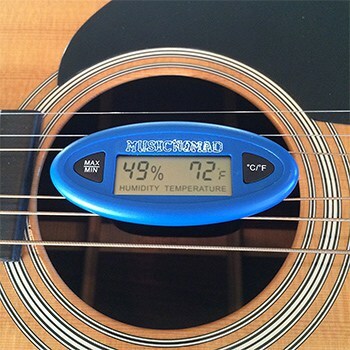 Before you can know what you need to do (if anything) about humidity you need to first buy a hygrometer to measure the humidity where you actually store your guitar. Don’t just rely on the daily weather report, because the conditions inside your house–or wherever you keep your guitar–can be quite different, especially if you run the heater or air conditioner. 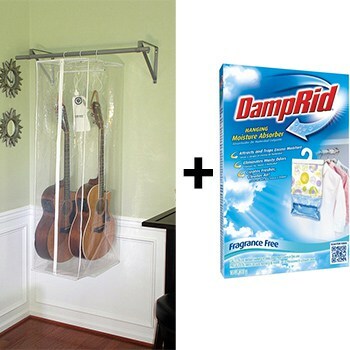 So, if you keep your guitar out in the open on a wall hanger or guitar stand, then measure the humidity of that room. If you store it inside a hardshell guitar case, then measure the humidity inside the case. You get the idea. Now that you know you should first measure your current humidity with a hygrometer, here are a few that I recommend. Like all products I recommend, I know these are great hygrometers because I currently use them or have at least tried/tested them with my own two hands. I own several of these, because they’re not only good for measuring room humidity (if you hang your guitars on the wall or keep them out on stands), they fit nicely inside an electric guitar case. 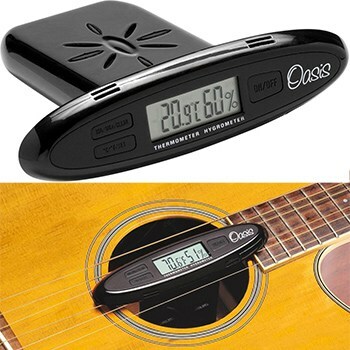 For acoustic guitars there’s a soft Oasis Hygrometer Holder which securely holds the hygrometer near the soundhole without scratching your guitar. I own 3 Oasis hygrometers: one to constantly monitor room humidity, and the others to measure humidity inside my guitar cases when I travel. I wanted to include at least one hygrometer here made specifically for acoustic guitar soundholes. You could use this as a room hygrometer too, but that’s not really what it was designed for (hence the shape). It slides between your D and G strings, which hold it securely in the soundhole of your acoustic guitar. Music Nomad makes excellent guitar care products (which I use myself), so I recommend them whenever I can. Want what I consider the ultimate remote guitar monitoring system? If so, also get the SensorPush G1 WiFi Gateway (sold separately) and you can monitor the temp and humidity of your guitars from anywhere there’s an internet connection. 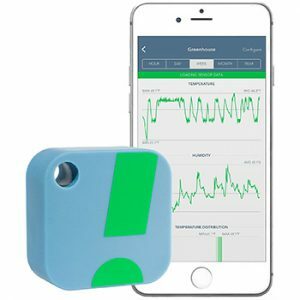 If you go for the complete system (sensor + WiFi Gateway) it can start to get pricey. However, if you’re a collector of rare, vintage, or expensive guitars, then this remote monitoring system is probably well worth the cost to protect your investments. There are a lot of unusually cheap (low cost) digital hygrometers on Amazon, and they all look a lot like the Oasis I recommended here. However, despite the visual similarities, I can’t vouch for any of those since I’ve never tried them. So, please do your homework before buying a hygrometer that I haven’t recommended here. Let’s get started by looking at humidity solutions for those of you who store your guitars where, as far as guitars are concerned, the air is too dry. This would be anywhere that the relative humidity is routinely lower than 45%. The further you get below 45% (and the longer you stay there), the worse it is for your guitar. You’ll need to get some moisture into the air around your axe. 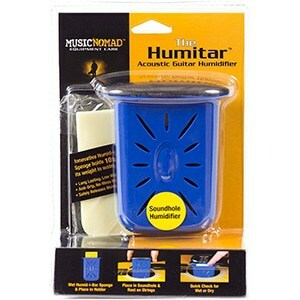 As a portable solution, I love the Humitar and use it in my own guitar cases when traveling. If you’d like to learn more before buying one, see my in-depth review of the Humitar here. 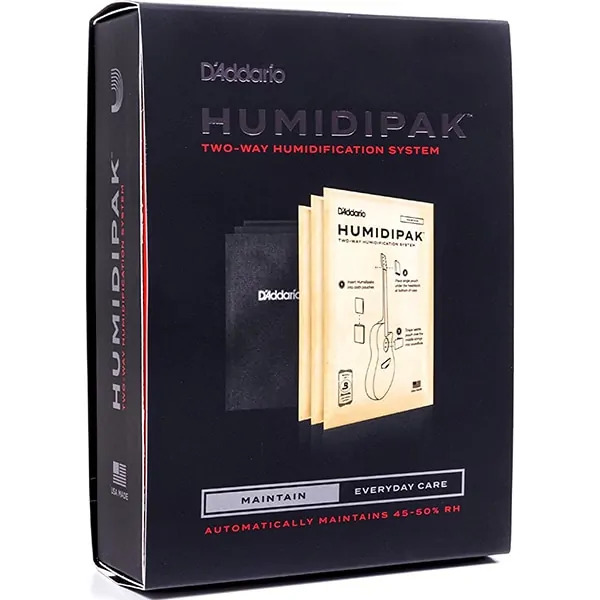 The Humitar has far exceeded my expectations compared to other sponge-based case humidifiers I’ve tried, and even outperforms fancier gel-type case humidifiers I’ve tried. Also check out their Premium Humidity Care System, which pairs a Humitar with their digital hygrometer. 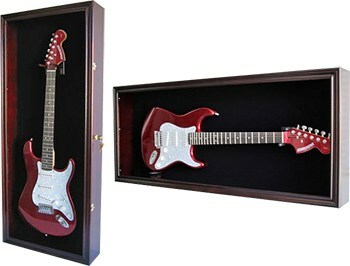 If you have an electric guitar, the company also makes the Humitar Guitar Case Humidifier with Holster. I’ve used both, and they’re excellent. The reason this is called “2-Way” is because this system protects your guitar from excessively dry AND wet climates. So, if your climate varies wildly throughout the year, or you often travel between regions with very different weather, this system takes all the guesswork out of humidity control. It’s a brilliant, low-maintenance system that works really well. The packets need to be replaced every 3-5 months, so be sure you factor that into your decision if you decide to go with this one. Here’s an all-in-one solution from Oasis that combines a digital hygrometer and humidifier sponge into one unit. I don’t currently use this system, but I’ve used other Oasis products over the years and I can tell you they’ve always been top-quality. I absolutely trust Oasis and am always 100% confident recommending them to friends and family. Because space is an issue in my music room, I use a Musik Tent inside my closet to protect my expensive acoustics. Here in the dry Arizona desert, humidity inside my house can drop to a wood-splitting 10% – 20%, but inside my Musik Tent it’s always a perfect 50%. The Musik Tent includes a hygrometer so you can easily monitor the humidity inside. When you’re ready to play, simply unzip the tent and pull your guitar out. It’s almost as easy as pulling it off of a guitar stand or wall hanger. At the time of this writing, I’ve had my Musik Tent for 5 months and have not had to refill the water reservoir yet. 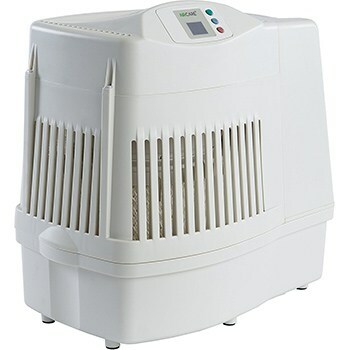 The system is VERY low maintenance, so if you’ve got the hanging space I feel it’s a better option than an evaporative room humidifier (discussed next). These work work well if you’re willing to do the maintenance/upkeep. I use this AIRCARE MA0800 in my music room for the benefit of the 3 guitars I don’t keep inside my Musik Tent. If you buy one of these, buy one that’s designed for a bigger room than the one you intend to use it in. That’ll allow you to run it on the lowest and quietest setting. My MA800 is labelled a “whole house” humidifier, and it’s just adequate to keep my 10ft x 11ft music room at about 45% humidity when set to the lowest and quietest setting. The biggest drawbacks to these systems are noise and maintenance. If you live in a very dry climate, you’ll have to refill the water reservoir about every 36 – 48 hours and replace the filter every 6-8 months. 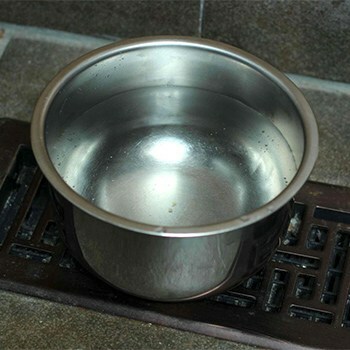 Also, you’ll have to add an anti-bacterial agent to the water every time you refill. That’s an additional product (and cost) that you need to consider. For mine, I use the Essick Air 1970 Bacteriostatic Treatment. Keeping open containers of water or plants in your guitar room will naturally increase humidity. Just know that these methods aren’t very efficient nor very precise. So, if you opt for these solutions it’s even more critical to have a hygrometer in the room to monitor humidity. If you live in a very dry region like I do, I doubt you’ll be able to pack enough plants and water into the room (safely) to keep humidity between 45% – 55%. For more ideas on DIY room humidifiers, check out this DIY Network article: 6 Ways to Humidify Your House (Without a Humidifier). Also search Google and YouTube for “DIY room humidifier” for a lot more ideas. 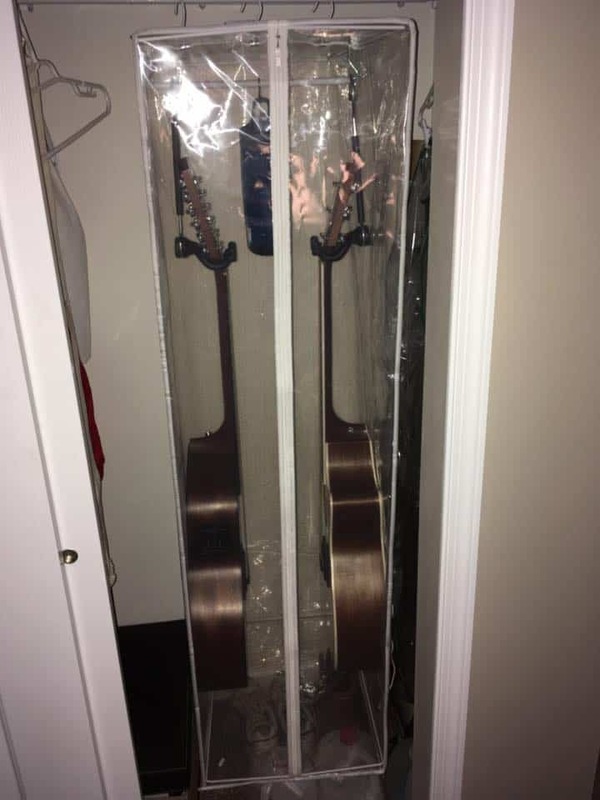 Next, let’s look at humidity solutions for those of you who store your guitars where the air is too wet for guitars. This is anywhere that relative humidity is routinely higher than 55%. The further you go above 55% (and the longer you stay there), the worse it is for your guitar. Moisture causes wood to swell, and too much can wreak havoc on your guitar. You’ll see a couple of the products mentioned up above re-listed here, because they work equally well for removing moisture. Back for a second appearance is the D’Addario 2-Way system. As I mentioned above, the whole reason it’s called “2-Way” is because it ALSO protects against overly wet climates. The unique humidity packets somehow absorb and release moisture… to keep things right around 50% humidity. I’ve no idea how they do it, but I know for a fact that they work well because I’ve actually used them. Also back for a second appearance is the Musik Tent, but with a slight modification that makes it ideal for protecting against very wet climates too (a tip given to me by the company’s owner, Damon). 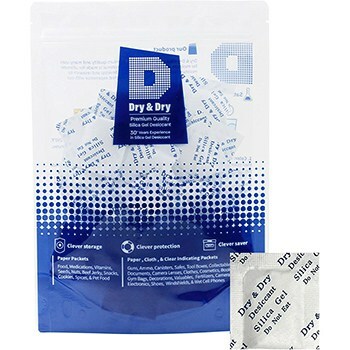 Instead of using the included humidity bag, hang a DampRid Fragrance Free packet inside the tent. However, note that the DampRid packets can actually over-dry, so be sure to check the included humidity gauge daily. If it drops below 45% inside the Musik Tent, experiment with unzipping the tent slightly to counterbalance things. Remember, we’re aiming for 45% – 55% (ideally 50% on the nose). Important! Use only the fragrance free DampRid, NOT the scented varieites. Not my favorite method, but I’ve used these desiccant packets in a pinch with good success. You can buy the Dry & Dry 1 Gram packets I’ve linked here, or simply save these packets anytime you find one inside your pills or food. Toss a couple in the open compartments of your case–one in the headstock compartment and one in an open area somewhere around the body. However, I have to stress: these are fairly imprecise, especially if you’re grabbing previously-used ones you’ve found. Those may no longer be good/effective. So closely monitor the humidity inside your case if you decide to use silica packets. Similar to keeping your guitar inside the case or inside a Musik Tent, you can store your guitar in one of these display cases along with one of the humidity solutions I’ve listed above. Then, you’ve got a really cool-looking way of protecting your guitar from excessive humidity, while keeping it easily accessible. 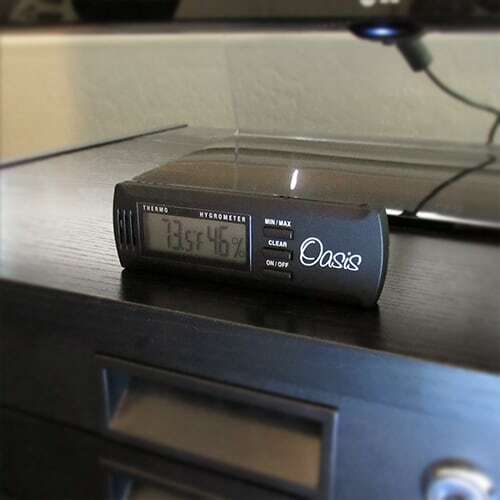 The usual disclaimer applies here: keep a hygrometer inside the case too and monitor it regularly to make sure the humidity inside the case is staying between 45% – 55%. Note that a display case like this is not, by itself, a “humidity control solution” per se. The case provides a sealed environment, but it’s up to you to add a humidifier or dehumidifier. Most display cases do not include these, by default. So there you have it–a few solid humidity control solutions for guitars. These lists are limited only to the products I personally know, trust, or use myself. I’m sure there are other great products out there, but I won’t recommend something I have no personal experience with. So, if you opt to purchase something that’s not on this list, be sure to do your research before you buy, and drop me a line in the “Leave a Reply” section down below to let me know what you think. I’m always on the lookout for great guitar products. 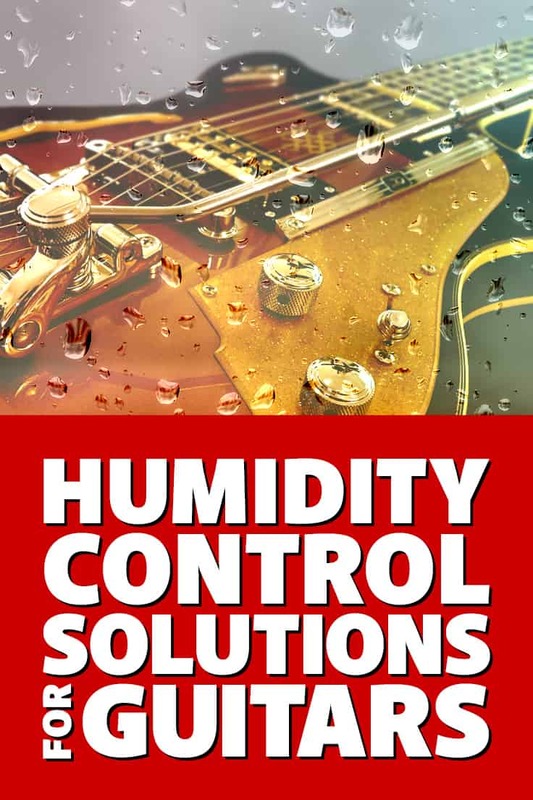 Do you use any type of humidity control for your guitars? I’d love to know, so give me a shout in the “Leave a Reply” section at the bottom of this page. I have a Martin acoustic that was stored for 5 years fully tuned in its case. When I took it out, the action was way high and there is a crack open in the top veneer between the bridge and the tail Typical low humidity problem. Question is How do I encourage the crack to seal itself (other than putting it near a humidifier at 50% RH) and once it does close, what action should be taken (glue?) what type? Can I do this myself or is it a skill thing)? I am switching to extra light strings as well because the neck bow was pretty severe; it’s now detuned a whole step and the action is ok, while I wait for it to stabilize. Thanks! Hi Mark. Since we’re talking about a Martin here and not a cheap, junker acoustic that you don’t care about, take this one to a pro. Fixing a top crack isn’t something I recommend someone “learn” to do for the first time on a valuable guitar. Take it to a pro, and if you want to learn to do this kind of work, find a cheap junker acoustic to practice on. If you find such a guitar (you can find cheap nylon string acoustics for $50 or less if you’re lucky), stick it in a case with some DampRid Packs and you’ll be popping glue joints left and right, and have lots to practice on. I feel dirty telling you to intentionally abuse a guitar, even a cheapo one, but it’s an excellent way to practice this kind of serious repair work. Though I’m familiar with the procedure for repairing a top crack, I’m not qualified to tell you how to do it yourself because I’m not a luthier or pro repair tech. Nor have I ever actually done the procedure. Hi Mark. If the neck’s twisted, you’ll actually be able to see it pretty clearly. If you sight down the neck with your eyes at the headstock end (looking down the fretboard toward the body), you can clearly see any twisting in the neck. A very slight twist usually isn’t anything to worry about and won’t affect playability. A more significant twist will be pretty obvious to the naked eye, and will come with all kinds of buzzy goodness whenever you try to play. See that twist? That’s what you’re looking for, and that’s no bueno. I’d recommend first just putting it inside a good airtight case with a couple D’Addario 2-Way packets (which I talk about on this page). Put one in the soundhole, and put one in the headstock compartment, so both ends of the guitar get the moisture they need. Don’t open that sucker for at least 2-3 weeks so the guitar has a chance to get back to its native 50% relative humidity. Once that’s done, you’ll probably find that the top crack has indeed closed-up quite a bit (but that’s not permanent–it still needs to be glued and properly repaired). Once you’ve given it the drink it needs, you’ll have a better baseline to assess what your next steps should be. Hi John. You don’t need to worry too much about your electric guitars. They tend to tolerate humidity extremes better due to the fact that they’re made of thick slabs of wood and any glue joints have large surface areas. Acoustic guitars, on the other hand, use thin sheets of wood and thin glue lines, so they’re the ones you have to worry about. Ironically, the higher-end acoustics are even more susceptible, because those manufacturers go as thin as possible with the backs, sides, soundboard, braces, etc. to allow more vibration and sound projection. Thanks for the info Dan, that’s good to know. I don’t have any experience with those bigger April Air units, but glad to hear it’s working well for you.